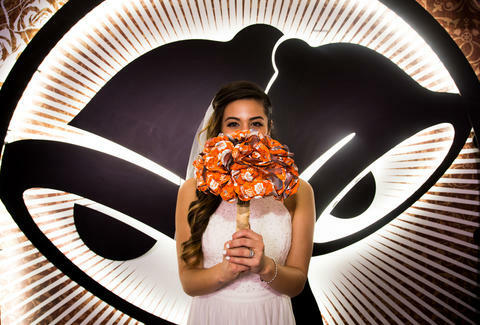 When Taco Bell first opened its flagship Cantina restaurant on the Las Vegas Strip back in November, it seemed like only a matter of time before the fast food chain started offering wedding ceremonies for diehard fans at the flashy taco mecca. Well, it looks like that time has finally come. Really. T-Bell announced Tuesday that visitors to the Las Vegas Cantina will be able to get hitched in a taco-themed ceremony at the restaurant's wedding chapel, complete with food, booze, and plenty of swag, starting this summer. Countless people have already celebrated their big days with Taco Bell, but the new wedding service makes it even easier for couples who want to pledge their love for each other and, uh, tacos. The news comes just days after Domino's launched of a wedding registry, meaning the fast food wedding of your dreams is now easier than ever. The T-Bell wedding service, however, will set you back way more than just a bag of midnight Crunchwraps and Smothered Burritos at $600. 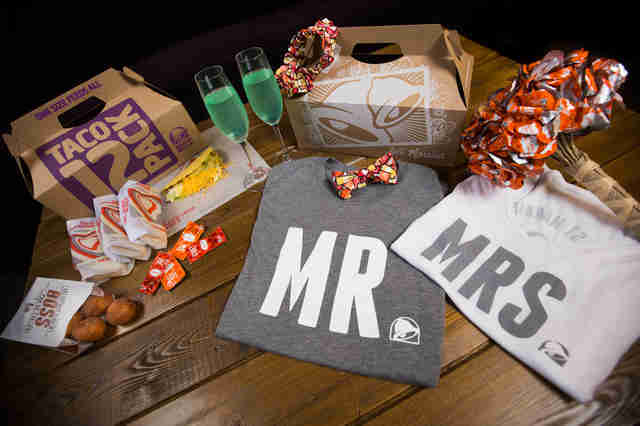 Along with a ceremony by an actually wedding officiant, here's everything you get: a Taco Bell garter, bow tie, Sauce Packet wedding bouquet, “Just Married” t-shirts, Taco Bell champagne flutes, a Cinnabon Delights Wedding Cake, and a Taco 12 Pack for your first meal as newlyweds. Oh, and probably a lifetime of suffering from heartburn together. Or something like that. To kickoff the summer of Fire Sauce nuptials, Taco Bell has also launched the Love and Tacos Contest and Happily Ever Crashers Sweepstakes, which will award one lucky couple an all-expense paid trip to Vegas to become the first to be married at the restaurant. Specifically, the winners will get free travel arrangements, accommodations at Planet Hollywood, and "the wedding of their dreams" at the newly minted Cantina wedding chapel. To enter, you'll have to share you love story with Taco Bell by February and fans will vote for the winning couple, according to the contest's official website. In other words, relationship goals. Anyway, we recommend asking your guests to throw fistfuls of TUMS at you instead of traditional rice. Tony Merevick is Cities News Editor at Thrillist and is totally perplexed by all the wedding-related fast food news lately. Send news tips to news@thrillist.com and follow him on Twitter @tonymerevick.